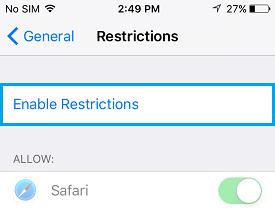 The Restrictions feature in iOS allows you to set up parental controls and protect your privacy by restricting access to Apps, settings and features on your iPhone. You will find below the steps to Enable Restrictions on iPhone or iPad. In order to prevent access to Apps, Content, Privacy Settings and Features on your iPhone, you will first need to Enable Restrictions on iPhone and then set up a private passcode of your own known as the Restrictions Passcode. After this you will be able to make use of the Restrictions feature on your iPhone or iPad to control and manage access to most content and features on your iPhone or iPad. 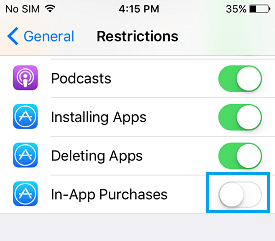 Restrict Apps & Features: App Store, iTunes, In-App Purchases, FaceTime, Camera, Safari, Siri, AirDrop, Installing Apps, Deleting Apps, Adding Friends to Game Center and Multi-player Games. 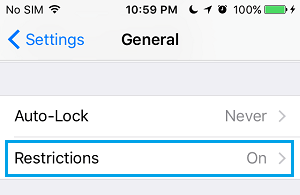 Follow the steps below to Turn on or Enable Restrictions on iPhone or iPad. 1. 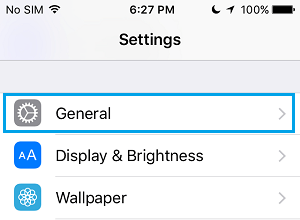 From the home screen of your iPhone or iPad, tap on Settings. 2. On the Settings screen, tap on General. 3. On the next screen, tap on Restrictions. 4. On the next screen, scroll down and tap on Enable Restrictions. 5. On the next screen, enter any 4 digit Restrictions Passcode. Make sure that you write down or save your Restrictions Passcode to a secure location. 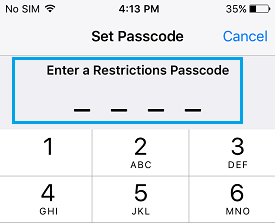 You won’t be able to Enable or Disable restrictions on your iPhone without knowing this passcode. 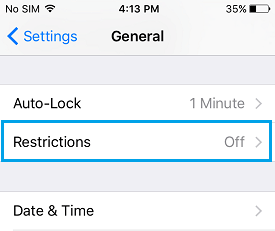 After Enabling Restrictions and setting up Restrictions Passcode, you are all setup to prevent access to any App, Setting or feature on your iPhone by using Restrictions feature on your iPhone or iPad. Setting up Restrictions for Apps, Content, Privacy Settings or any feature on your iPhone is quite simple. 1. Tap on Settings > General > Restrictions. 2. You will be prompted to Enter Your Restrictions Passcode. All that you need to do in order to place Restrictions on any of the listed items is to simply move the toggle to OFF position. For example, in the image above you can see that we have disabled In-App Purchases on our iPhone by moving the toggle for In-App Purchases to OFF Position. 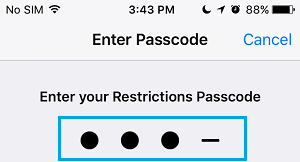 After this setting, anyone trying to make an In-App Purchase on your iPhone will be prompted to enter the Restrictions Passcode and won’t be able to make any purchase without knowing the Restrictions Passcode. Related: How to Block Websites on iPhone or iPad. 2. You will be prompted to enter your Restrictions Passcode. Enter your current Restrictions Passcode. 3. On the Restrictions screen, tap on Disable Restrictions. 4. You will be prompted to enter your current Restrictions Passcode. 5. Next, tap on Enable Restrictions. 6. Finally, enter a new 4 digit Restrictions Passcode.